Experience the power of having a web-based donor management solution with our free mobile app! DonorPerfect Mobile gives you access to your DonorPerfect Online system from your iPhone, iPad and Android devices anytime, anywhere! 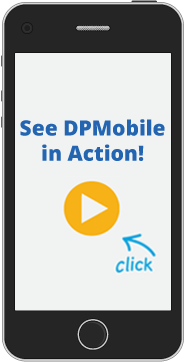 DonorPerfect clients can collect payments outside the office via the DPMobile app on their phones and tablets. 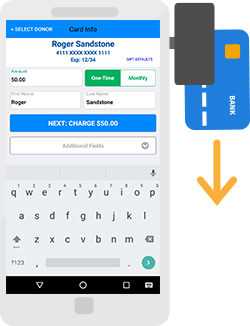 Whether at a fundraising event, or in a donor’s home or office, it’s simple to enter payment information directly into the phone, or “swipe” a credit card via our encrypted mobile card reader, and have the transaction processed, recorded, receipted and acknowledged automatically! With DP Mobile you can even scan in credit card information quickly and accurately using the camera on your iPhone, iPad or Androide device. Voice to Text – The Perfect Note Taker! Has this happened to you? You’re on a donor visit and it’s going great. You’re taking notes, then you get back to your office and try to decipher what you scribbled down, or remember what they said? One of the hardest things to do is get that info about the visit back into your system. 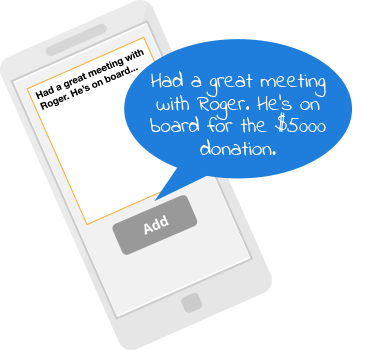 With DPMobile, you can dictate a note into your phone after a donor visit that logs the information into the DonorPerfect Contact Manager. Now you have accurate notes entered right into the donor record immediately – while you can still remember the details! Further, the notes become immediately available for everyone who has access to the record. Very useful- Surprised how much data I can access. Very quick. Love that I can dictate a note about a conversation into a donor record…Overall, I love it. I am constantly on the road! This App allows for me to quickly look at my donors information and quickly add contacts! Great App! and learn why so many nonprofits love their DonorPerfect Fundraising Software!